Sneak a Peek is an exhibition for curious passersby and art audiences alike, for all of the women, men and children on the street. 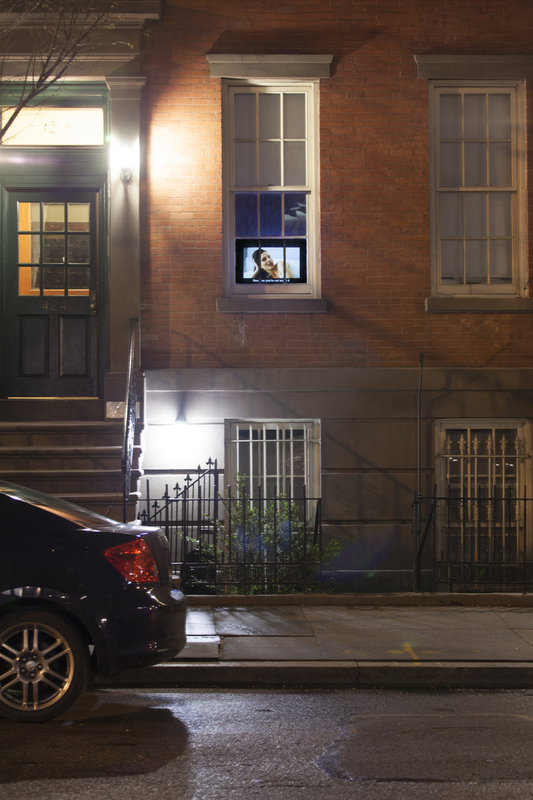 The show features six video works that are displayed on TV monitors inside individual apartments. These monitors are placed right behind the windows facing West 22nd Street in New York City. When curator Lal Bahcecioglu approached the tenants to use their windows, many responded with enthusiasm, and some needed a little more encouragement; in the end, they all agreed happily to partake in this unique experiment. Sneak a Peek showcases a range of video-based works by artists Graciela Cassel, Lourdes Correa-Carlo, Ghost of a Dream, Sara Eliassen & Lilja Ingolfsdottir, Kanako Hayashi, and Mille Kalsmose. What happens behind windows, closed doors and drawn curtains is always a great source of curiosity. Sneak a Peek sets free this desire and gives viewers the chance to stop and really look, without the fear of voyeurism. Sneak a Peek offers an innovative way of exhibiting video art and reaching a wider audience of people who may come upon the work by chance. By its very nature, this project turns the notion of exhibiting on its head, with passersby becoming viewers looking in, and residents within becoming the exhibitors rather than the observers. Kanako Hayashi illuminates in her work The Time of Leaves the aftermaths of The Great East Japan Earthquake which occurred on March 3, 2011. 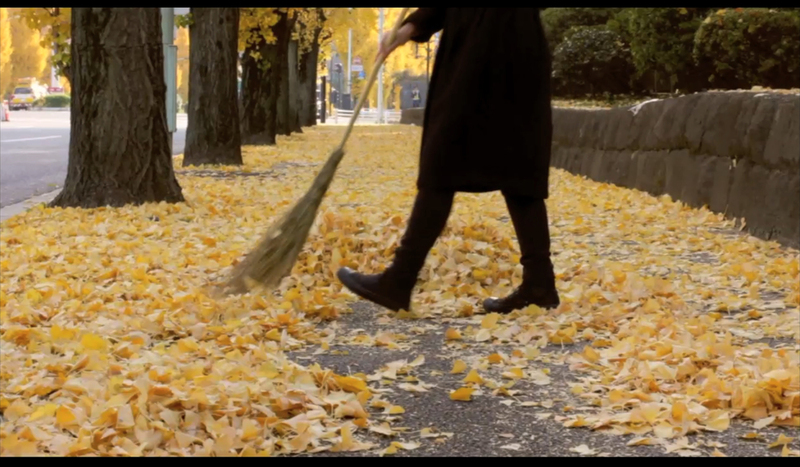 She sweeps the street that is covered with contaminated golden yellow Ginkgo leafs symbolizing the consequences of this natural disaster. The Time of Leavesreminds us that there could be much more to worry about walking down the streets of New York than just trying to avoid stepping in something nasty. Mille Kalsmose visualizes in her work New Narratives the inner dialogues that we regularly confront on a day-to-day basis. She creates a pattern for each thought and visualizes a series of them by drawing that pattern over and over again on a sheet of white paper. For Sneak a Peek, Mille Kalsmose bravely shares these thoughts from a private area of the house, the bedroom as the exhibition space, reflected onto a public sphere that is the street. She investigates the idea of openness and differences between public and private arenas. No Title (Light) by Lourdes Correa-Carlo is a single shot of the sun seen through trees that are swaying in the wind. Her piece is placed above the level of pedestrian’s eye-sight, on the third floor of 333 West 22nd Street. By looking at the piece from below, one has the same degree of the camera—both directed to the sky. The concept of seeing a landscape view indoors creates an absurd fantasy for the viewer. Right next to Correa-Carlo’s work, one can see the new work Subliminal by Graciela Cassel. Her work juxtaposes two of the elements of nature—air and fire—as forms that interlaces with one another. The artist’s way of transforming these elements creates a contradiction that alters one’s perception. To encounter her work, one also must look up to the third floor, seeing clouds and air as a sort of new “window” onto a different world. The artists duo Ghost of a Dream also created a new work, titled The End Is Fine. This video is displayed on two adjacent screens in the window of Chelsea Frames. Each screen displays different ending sequences from classic films, and they are united by their aligned horizon lines, creating a continuous line across both. This piece questions the end of filmic suspension of reality, compelling viewers to think about what “the end” means in varying contexts, and inviting all to be aware of what is happening around us. Not Worth It - Shine and Not Worth It - Glow by Sara Eliassen and Lilja Ingolfsdottir are short films imitating the language of commercials, in order to expose strategies employed by the advertisement industry. The films were first screened as false advertisements in TV-channels, in movie theaters and on screens in public spaces throughout Norway during one week in 2007. Due to their placements behind the windows of 424 West 22nd Street they ignore the household and draw attention from the outside public, instead of being ignored by their audience inside homes. Maybe for the first time, the idea of advertisements could be seen as an eye opener! Sneak a Peek will take place on 22nd Street between 8th and 10th Avenues, right next to the blue-chip gallery district of New York, and will be on view when the nearby galleries close their doors to public. The venues are the ground floor at 325, basement of 326, third floor of 333, first floor of 424 West 22nd Street, and the ground floor at 197 Ninth Avenue, in the windows of Chelsea Frames. Sneak a Peek in New York is the first version of this project. The show will take place in other locations with different artists in the future. Download the exhibition map here! Please contact Lal Bahcecioglu (lalbahcecioglu@gmail.com) for further information and to schedule a guided exhibition tour. The delicious foods and drinks at the events of this project are generously sponsored by Upicnic. Istanbul Art News, "Evden Sokağa taşan videolar"
ArtSlant, "In Chelsea, Staring Through People's Windows to Look at Art"
HaberTurk, "New York'un ilk sokak sergisi Sneak a Peek açıldı"
Paper Mag, "11 Must-See Art Shows Opening This Week"
Chelsea Now, "Community Activities: Week of April 14, 2016"
Upicnic Blog, "How to Be Cool in NYC This Week: Enjoy a Brilliant Art Exhibit, Sip Lemonade"
Gothamist, "5 Fun Things To Do In NYC This Week"
DNAinfo, "Video Art Exhibit to Beam from Chelsea Residents' Windows"